When you are making a billion dollars a year, it is easy to donate a million to a good cause. When you are a small business, or an independent contractor, likely bringing in revenue that is barely pushing 6 figures, it is really hard to give back. We’ve seen lots of interesting business models in product-focused business over the years such as the One Laptop per Child initiative, and the infamous “One for One” model from TOMS that proceeded it, but what model of business can be created to turn philanthropy into an integral and viable component of service-oriented business? Why does giving back always have to be seen as an extra-curricular activity for service providers? We hear about billionaires like Bill Gates giving away half of their net-worth upon death, but is that kind of impact really limited to the mega-rich? Do we really need to die before we can make an impact? Is philanthropy an activity reserved solely for the rich? Do the historic characteristics of a philanthropist remain relevant in today’s society and economic landscape? We have seen great progress in the development of corporate social responsibility programs amongst the Fortune 500 class, but what about small business? Why do we hold big business to such a high degree of scrutiny when it comes to giving back, but when small businesses do nothing we don’t even take a second look? Society Only Expects 1% of Businesses to Engage in Philanthropy. The Definition of “Philanthropy” is Outdated and Limiting. Consultants Expect Compensation In Exchange for Social Impact. Dilemma #1. Society Only Expects 1% of Businesses to Engage in Philanthropy. There is a very loud majority that is critical of big business. We demand transparency. We want to know how and when corporate executives are spending their money. Billionaires are an easy target for public scrutiny, and as a result, we maintain high expectations when it comes to philanthropic engagement amongst big businesses. It is questionable whether or not all of this criticism has actually led to any real change in regards to corporate greed, but there are a few tangible things that have come of these high standards over the years: a spike in CSR (Corporate Social Responsibility) initiatives, the more frequent publication of Corporate Giving Reports, and a steady rise in annual contributions to non-profit organizations from big businesses and the C-level executives that run them. The US census documents 27.28 million businesses in the United States. Of these 27.28 million, less than 1% can be categorized as a “big business.” This leaves us with 27.26 million entities in the private sector that can be categorized as “small business.” While it is crucial to continue holding the highest of expectations in regards to corporate giving amongst the Fortune 500 class, it is a huge missed opportunity to not leverage over 27 million revenue generating businesses for the greater good. Why has this not been talked about before? Why didn’t the Occupy protesters make any signs against that mom-and-pop shop down the street? Why do we hold big business to such a high degree of scrutiny when it comes to giving back, but when small businesses do nothing we don’t even take a second look? The answer to these questions is actually quite simple: small businesses don’t make as much money as big businesses. 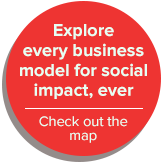 The idea that small business owners would engage in philanthropy to the same level that a Fortune 500 company does has been accepted as “impossible.” Unfortunately, however, these assumptions have been made without first exploring new, more creative, models of impact that allow for giving to coexist with business success instead of solely proceeding it. Dilemma #2. The Definition of “Philanthropy” is Outdated and Limiting. Contrary to popular belief, the act of being philanthropic does not necessarily begin or end at the stroke of a pen. Instead, philanthropy has the opportunity to go far beyond the power of monetary transaction alone through the donation of time because talent is a multiplier. Non-profit organizations are spending billions upon billions of dollars each year on service-provider fees,. Very often these dollars are being spent ineffectively. Imagine the impact that billions of spare dollars could have. When an organization is able to save valuable resources, they are able to immediately re-invest those dollars directly into their cause. Pro-bono work is necessary. While spending increases each year, funding decreases. In 2013, we saw cuts to funding for non-profit sector from the federal government totaling $62 Billion, but in 2012 foundation money only totaled 46 Billion. The social sector is becoming drained of resources, and traditional philanthropy clearly doesn’t cut it anymore. We need new models of philanthropy that will allow non-profit organizations to save valuable resources in order to clear up the social sector’s economic disaster. The old model of business designs for the short term. The old model of wealth is to introduce philanthropy after the riches. The new model of business, however, designs for the long term. It designs for wealth and philanthropy to come simultaneously. A lack of funding is only an issue if there are a lot of expenses. As business owners, freelancers, and entrepreneurs, we need to do our part by making giving back an integral component of our business. Dilemma #3. Consultants Expect Compensation In Exchange for Social Impact. In her famous account of Adolf Eichmann’s trial in Jerusalem, Hannah Arendt introduced the expression “the banality of evil.” Her concept was that some of history’s greatest evils, such as those that took place in Nazi Germany, were actually not executed by the hands of sociopaths, but instead by every day people. Under this ethos, Arendt explains that the actions of these ordinary people are committed due to the perception that their participations were “normal” thanks to the fact that the root of their acts were mandated by figures of authority in their state. In recent years, concepts that serve as the antithesis of the pro-bono movement have become more and more popularized. Thought leaders can be found proclaiming the concept that non-profits should be rewarded by maintaining high overhead in order to scale their message through the power of marketing. While the intentions of such ideas are seemingly authentic, the result of their execution would be catastrophic to the social sector. There is an overwhelming consensus amongst consultants that we deserve to be paid for the social impact that we create, but what is not understood is the reality that when we charge for the work, our own social impact is void. The widely accepted idea that “social impact” is something that can be done with a direct profit-margin is one of the biggest unknown problems of our time. It is a new kind of banal evil, and it is plaguing the social sector. As consultants, we do not posses the ability create social impact, but our clients do. We are nothing more than facilitators of social change. It may be hard to accept, but as service providers the only chance we have at creating social impact is by refusing payment in order to allow those who are creating social impact do so with an abundance of resources. The success of an organization’s marketing campaign is not at all related to a budget so long as those who are leading the campaign do their best work regardless of getting a pay check or not. Under this objection, Sandel explains that the authenticity of moral and civic “goods” can actually be diminished or corrupted if they enter a traditional economic mindset of “buy” and “sell”. When charities are positioned in the economy to not profit and depend on public donations with less autonomy of businesses, making a profit from a disadvantaged sector falls under the fairness objection. Perhaps it isn’t ethical, efficient, or fair for the nonprofit industry to spend nearly $8 billion each year on design and marketing expenditures in the US. Sure, awesome marketing campaigns and excellent strategic plans are incredibly important for charities, but the enormous allocation of funds and energy in purchasing these services are entirely misplaced. This is especially true because the primary mission of a non-profit organization is not to have the best designed campaign and social media platform comparable to their competitors, but rather to serve an underserved community efficiently & effectively. For the type of work nonprofits do to bridge the inequality gaps, they themselves are held back and limited by the absurd invoices from service-providers they are receiving in their mailbox each week. Pro-bono services via the private sector are incredibly critical (and fair) in the effort to enable non-profit organizations to focus their energy on what they should be: their impact.